Martin Wijesinghe is one of the significant personalities in Sri Lanka. He has expertise in indigenous medicine, biology, zoology, cultural heritage, history, science and English. 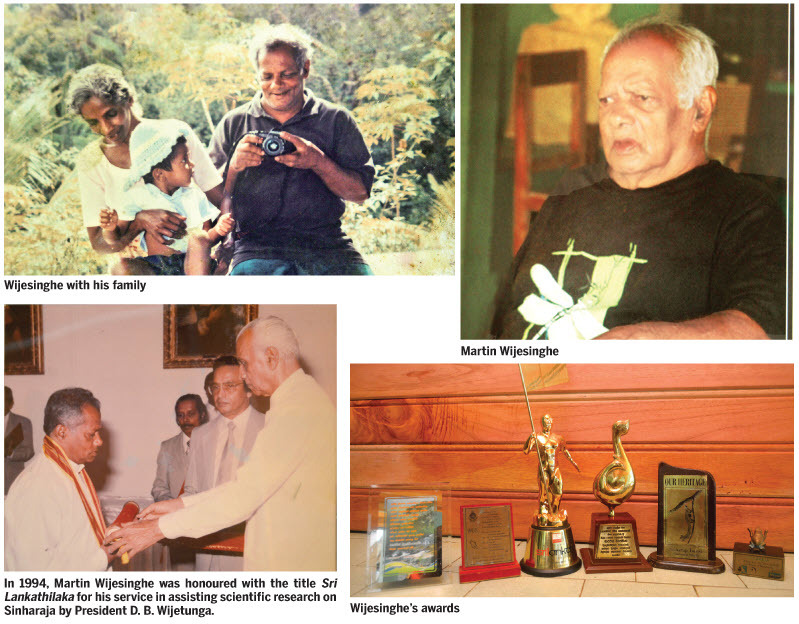 Martin Wijesinghe is considered the unofficial Professor of Sinharaja Forest. He was born on December 24, 1939, in Pethiyakanda, and started schooling at the age of nine. He had a younger brother. Their mother died when they were very young. He studied only up to Grade 8, but no one can challenge the knowledge and experience he has about the Sinharaja Forest. He married on September 18, 1958, at the age of 19. In 1959, he moved with his wife to a village in the Sinharaja Forest called Kudawa. That was 58 years ago. He has five daughters and two sons. At that time, hunting and felling trees for various purposes were the only benefits obtained by the people from the Sinharaja Forest. After seeing the forest, Wijesinghe understood the huge threat that existed. The arrival of forest conservation officials in 1960, gave him huge relief. According to Wijesinghe, foreigners behave more responsibly during their visits to the Sinharaja Forest than local tourists. Some of the activities of these irresponsible tourists pose a huge danger to the forest. Their only aim is to have fun. They do not pay attention to protecting the forest. Wijesinghe joined the Forest Conservation Department in 1968, for a salary of Rs. 6.50. He served as a casual labourer at the Forest Conservation Department in the 1970s. In 1968, there was significant forest destruction, which occurred due to certain research projects. With his vast knowledge of the Sinharaja Forest, he became its unofficial caretaker. He assisted all local and foreign scholars who visited the forest for educational and research purposes and also received scientific knowledge on the forest from them. He learned zoology and botany from Professor Balasubramaniyam of the Peradeniya University and Professor P.B. Karunarathne, respectively. He assisted them with their personal surveys of plants and animals in Sri Lankan forests. The three of them collected data by rummaging through wet zone forests for around five years. This wide-scale research provided him with an enormously enlightening and exciting experience. In the course of this research, he discovered a variety of yam (Gona ala) and it was named after him (Dias Corea Wijesinghe). According to Wijesinghe, the Sinharaja Forest received international attention in 1977, when scholars started visiting the forest for research purposes. In 1980, a special research centre was constructed for the use of scholars who visited the Sinharaja Forest. On August 1, 1981, Wijesinghe was appointed as the caretaker of the new research centre. He started assisting all researchers who used this centre. The student Neela De Zoysa, who studied botany at this centre in 1982, gave him a Malalasekara Dictionary, which greatly helped him to learn English. Wijesinghe always closely interacted with all scientists and researchers who visited the Sinharaja Forest and carefully observed their work. Eventually, he started studying the names of plants, as well as English words using the dictionary. He learned Latin from a schoolteacher from St Thomas’ College, Mount Lavinia, who visited the forest. At 80, Wijesinghe still remembers the botanical name of any tree or leaf found in the Sinharaja Forest. There were young academics who assisted the senior researchers. Dr. Sarath W. Kotagama, Dr. Nimal and Savithri Gunathilake, Neela de Zoysa, Ryhana Raheem, a Professor of English and a leading activist of March For Conservation (MFC), M. D. Dissanayake, Cyril Wijesundara and Mark S. Ashton were a few of the young academics who were very close to him. Wijesinghe helped them with their research work during their absence in the field. “The timber required for my house was bought from outside and not a single tree in the forest was felled when constructing the house. Yet unscrupulous local visitors have posed the greatest threat to the forest. They dispose of garbage, mainly polythene, over the forest ground. Many careless visitors seem to consider Sinharaja a place for enjoyment, which it is clearly not. They wish to enter the forest unaccompanied by a guide and they want to learn nothing. Sinharaja is a university of nature. It must be conserved for future generations,” he said. “Now there are adequate numbers of people, institutions and resources to protect the Sinharaja Forest. But, there are many other forests in the country which need protection. It is the responsibility of all relevant authorities to protect them. Now we eat the fruits of trees which were planted by past generations. It is the responsibility of all of us to plant trees in our home gardens as much as possible,” he said. The Sinharaja Forest Reserve is a national park and a biodiversity hotspot in Sri Lanka. It is of international significance and has been designated as a biosphere reserve and a world heritage site by UNESCO. According to the International Union for Conservation of Nature (IUCN), Sinharaja is the country’s last viable area of primary tropical rain forest. Over 60 percent of the trees are endemic and many of them are considered rare. The hilly virgin rain forest, part of the Sri Lanka low-land forests eco-region, was saved from the worst of commercial logging by its inaccessibility and was designated as a World Biosphere Reserve in 1978, and a world heritage site in 1988. The reserve’s name translates as the ‘Lion Kingdom”.